This happens every year. EVERY single year. Pretty much every single event. I spend a lot of time doing costumes for my kids or other people, and end up without a costume myself. I’ve decided that the month of January is now devoted to doing a costume just for me. Enough is enough. There needs to be a little self love here. I always manage to get myself twisted up into knots about costumes. Is it good enough? Does it look too homemade, too cobbled together? I spend too much time second guessing myself – afraid to start – and then when I do start I spend far too much time obsessing about tiny details that, realistically, no one else will ever notice. I set a higher standard for myself with Munchkin’s Jedi outfit for Miscon. Honestly, I’m a little disappointed in myself for copping out on this one. Cue Robin Hood. I was aiming for the Disney Robin Hood feel with a few of the classic Errol Flynn notes thrown in. Originally I planned to make a quiver and some arrows, and boot tops, and he was going to wear the white pants from his Jedi outfit… buuuuuut the pants got dirty yesterday and I couldn’t find the shirt that I wanted to put underneath the tunic and so we ended up with all gray instead. Munchkin insisted on the blue cape instead of the green one, and I couldn’t find the other boots I’d made for his Jedi outfit… so… this is his one hour costume. The belt is recycled from his Jedi outfit. I had so much fun making that, way back when I did… I want to make more cool kids’ belts. The only, and I do mean the ONLY picture I managed to get of him smiling. You can’t see it but there is a red feather on his left side. For Little Elf, I already knew I was going to go simple… my cousin sent me a fuzzy baby outfit with ears and wooden buttons on the front. I looked at that and instantly decided he’d be Max from Where the Wild Things Are. I should have done a different tail… I realized too late that Max’s tail is actually a furry tail, but I think the crown sold it. People at least knew who he was. As for my outfit… well, the badass steampunk pirate I wanted to do morphed into … what can I put together that looks sort of piratey because I can’t find the poet shirt I made two years ago, don’t have time to make a skirt, and in general am running out of steam. 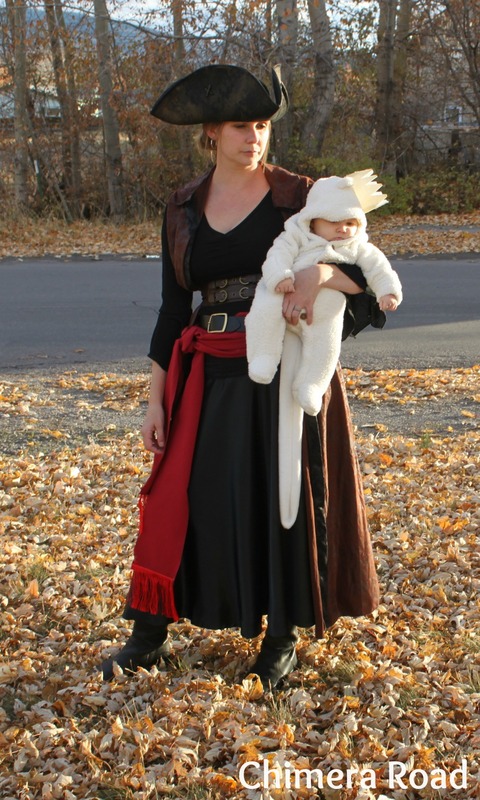 Hence… weird witchy pirate get up. In other news… this is the last post of the 2013 NaBloWriMo challenge. Holy schnikies I made it! I am inordinately proud of myself… I’m not sure what my previous record was but I’m sure it wasn’t more than 10 days. (I think it was actually 6.) I decided (insanely) to take on this challenge this month for a couple of reasons… I wanted to force myself to write more, I wanted to make connections with other bloggers, and I needed to prove to myself that I am still capable of accomplishing something even with a new baby and less than 3 1/2 hours of continuous sleep at night. On all counts, I feel that I succeeded… I’ve “met” some really wonderful folks through the blog hopping I’ve done this month, written more than I ever thought I would, and I definitely managed this with a (now) two month old! Go me. Go US!!!! Congratulations to everyone! 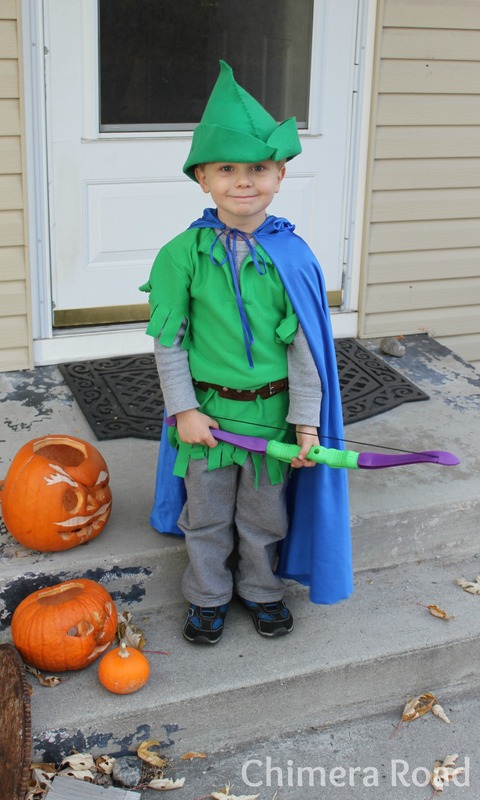 Robin Hood is adorable! I love it. Don’t be too hard on yourself, I am surprised you got out the door at all, and dressed up too! I like your costume. There is nothing better than a witchy pirate. And poor Max, he looks all tuckered out. At least he had a comfy outfit. That is the key, a comfy costume. If not comfy, it will become your worst nightmare, and you may have a naked kid. Congrats on making it through NaBloWriMo! It isn’t easy. Go you!! Wanna try NaBloPoMo? I am, crazy yes. I signed up through Blogher.com. No rest for the weary… Oh gods, I guess not! Let me think about that for a couple of hours! Just wanted to hop on here and tell you way to go on making it through NaBloWriMo love. Great job, I am proud of you! Congrats on your success with NaBloWriMo this year! Not an easy task, but you rocked it. 🙂 Much like you’re rocking that witchy pirate outfit (which looks great, btw). Love the kids’ outfits. Thank you. 🙂 And thank you for the loan of the hat and coat!